Rum (or Rùm) is the largest of the four Small Isles off the west coast Scotland. It has a permanent population of about thirty, centred around the harbour at Kinloch on the east coast. Inhabited since the eighth millennium BC, Rum has provided some of the earliest archaeological evidence of human occupation in Scotland. Under the changing ownership of various clans and lairds, the population grew to over 400 around the start of the nineteenth century but was cleared of its indigenous population in the first half of the nineteenth century. 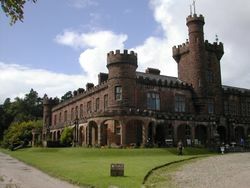 The island was then a sporting estate and the somewhat bizarre 'Kinloch Castle was constructed in 1900. Rum was purchased by the Nature Conservancy Council in 1957, and then passed into the ownership of Scottish Natural Heritage. A summit, called in December 2007, initiated a process whereby islanders have subsequently voted in their majority to see the island pass into the ownership of the Isle of Rum Community Trust. The intent is for the island to become self managed, similar to the situation on Eigg, and for residents to have greater control and input into the development of the island and its resources. Rum is of exceptional ecological importance, but thanks to its volcanic origins and its present day wildlife, notably red deer and white-tailed sea eagle. With the exception of Kinloch, the island is uninhabited, and offers stunning landscapes and walking. The Caledonian MacBrayne  ferry MV Lochnevis sails to all four of the Small Isles from Mallaig throughout the year. It calls at Rum once on Monday, twice on Tuesday, twice on Thursday and once on Saturday during the winter; twice on Monday, twice on Wednesday, twice on Friday and twice on Saturday in the summer. During the summer, Arisaig Marine  provide wildlife sightseeing cruises from Arisaig, about 10 miles south of Mallaig. Single fares are available. If not travelling to Mallaig or Arisaig by car, you can reach the ferries by scheduled ScotRail  train service along the West Highland Railway (although note that the pier at Arisaig is not as close to the railway as the pier at Mallaig). The famous 'Deerstalker' Caledonian Sleeper provides first class (single cabin) and standard class (double cabin) sleeper and reclining seat travel between London Euston and Fort William every night except Saturday. Local trains connect to Mallaig. If travelling by day train, travelling to Rum from anywhere further south than Fort William is only possible without an overnight stop in Mallaig on summer Saturdays, when the early morning train from Glasgow Queen Street station connects with the second CalMac sailing to Rum. Travelling from Rum to points beyond Fort William by day train is likewise only possible on summer Saturdays, when the first CalMac sailing from Rum connects with the train to Fort William and Glasgow Queen Street. The Tea Shop is located inside the Rum community hall, and is open daily (11:00 - 16:00) from April to September for hot and cold drinks, snacks, light meals and home baked treats. The wild deer of the island can be sampled in the Venison Stew, which is normally available and highly recommened. Self-catering visitors to the island can stock up on food from the small community managed General Store & Post Office, located in the community hall. A selection of vegetables, groceries, snacks and alcohol is available, although larger groups should pre-order large orders three weeks in advance. Staffed by volunteers and open daily from 17:00 - 19:30. The Post Office keeps different hours, check the notice outside. Two Bothies are maintained by the Mountain Bothies Association  at Dibidal and Guirdal. The campsite by the shore at Kinloch offers basic camping facilities, with a standpipe, stone sink and toilet. Wild camping is permitted on the island, but you must notify the reserve office before departure who will advise you where not camp during sensitive periods for wildlife. Fires are not permitted when camping wild. The Reserve Office can provide information about the island, as well as outdoor activities and camping. Tel +44 1687 462026. This page was last edited on 3 January 2017, at 10:43.